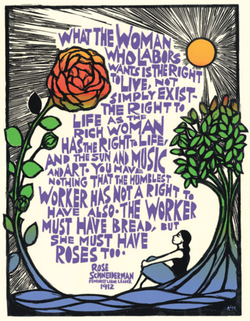 Here are the words of Rose Schneiderman, rendered into beautiful art by Ricardo Levins Morales. I found the image in a Google search, and Ricardo has graciously given me permission to use it here. Please check out his amazing work here. I"m inspired by Ricardo's work. In 1912, women who were factory workers in Lawrence, Massachusetts went on strike for fair wages and better working hours. Their rallying cry was that they needed bread to feed their families but they also needed roses. We need to eat, but we also need beauty. What the woman who labors wants is the right to live, not simply exist - the right to life as the rich woman has the right to life, and the sun and music and art. You have nothing that the humblest worker has not a right to have also. The worker must have bread, but she must have roses, too. Schneiderman's words were eventually set to music by Mimi Fariña, the sister of Joan Baez. You can hear them sing it here. So, why did I call my Blog and website Bread and Roses? I wanted a place where I could place writing and reflections, and also a place where I could share my art. It seemed to me that in my own life my writings and sermons are the bread, and the things I make are the roses. Also, as an alumna of Mount Holyoke College, the song Bread and Roses has special meaning for me, as graduating seniors sing it each year on the Saturday of graduation weekend. We drape the founders grave in a laurel chain, representing the unbroken chain of women who have been educated at Mount Holyoke and our connection through the generations. ​I hope that in this place, you find sustenance, beauty, and connection.